previously, i ate peking duck at Dayali in Markham. 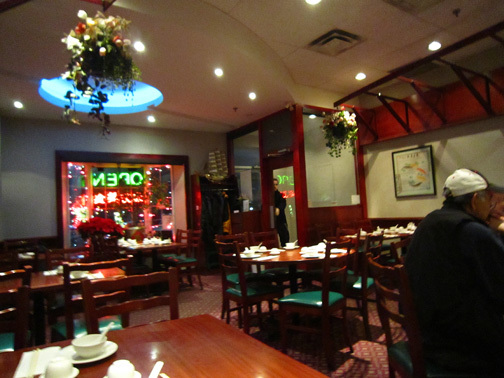 after that enjoyable meal, i was curious to see how my usual go-to peking duck establishment fared in comparison. this establishment is nestled in between other stores in the outdoor access only section of Market Village. it has been the place i’ve gone to in previous years for a peking duck fix. 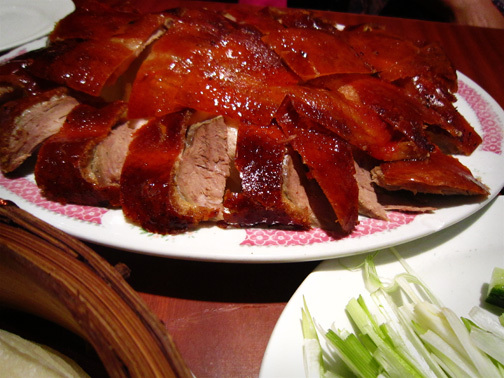 as i mentioned in the previous post, many restaurants offer peking duck in a 2 or 3 course format. the main/first course is always the crispy skin (and some slices of meat) with steamed wraps and condiments. the wraps can range from delicate and thin (what i prefer), to thick and doughy. as i wanted to be able to compare the broth at both places, we opted for the 3 courses. the main course – after what may seem like a very long wait (depending on how hungry you were when arriving, and/or what other dish(es) you ordered), the first thing that happens is a server brings over the whole roasted duck to show you and then returns to the kitchen to carve it (sorry, missed the photo op on this one). the preparation of peking duck apparently should take a bit of time, unlike if a place serves up bbq roasted duck as the peking roast one, so once the roasted duck is presented, you can start the official anticipation of biting down into the parcel of soft thin dough paired with crunchy, tasty goodness. the plated food has large pieces of skin and some pieces of meat sitting atop prawn crackers. 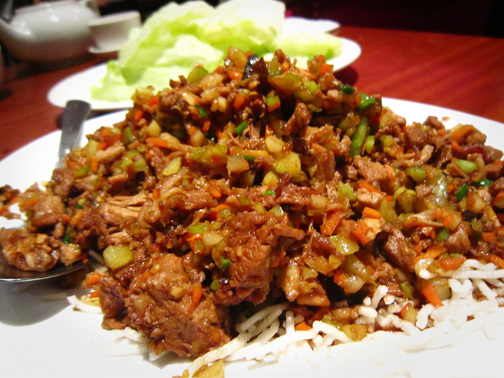 the dish is served with ample scallions and cucumber, with a simple presentation. wraps were thin and easy to handle, but they cooled quickly without a continual heat source. i really wanted to love this peking duck. but while some pieces of the skin had the right degree of crispness, there was sadly a slight chew to the largest pieces (coming from the main body of the duck). the underside also showed no adhering fat, but the meat was a bit drier and in larger morsels was less appealing to me. 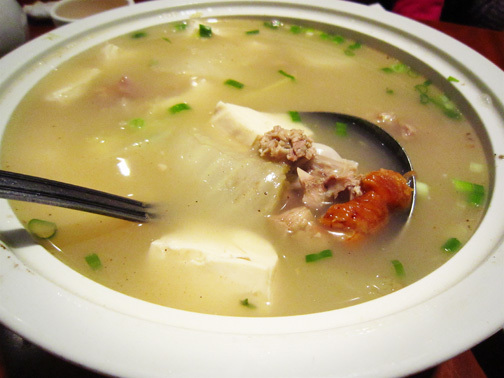 the soup had nice flavour, but its consistency did not wow me as the one from Dayali did. the crispness and coolness of the lettuce wrap offered a nice contrast to the main dish, the filling was tasty, but a tad too celery-dominant than i prefer. my biggest disappointment was with the scant amount of fried rice vermicelli. these little crunchy bits add a nice textural component inside the lettuce wrap, and i could have used a lot more of it. other dishes: i have to admit, i’ve rarely ordered other dishes that were outstanding. the vegetables all seem rather pricey at approx $9-12 each. 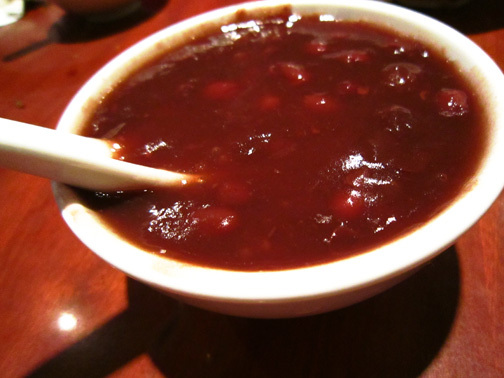 you do get a free dessert – a pretty standard little bowl of red bean soup. it’s never been something i’ve particularly liked and this one was a tad worse being it was so thick it wasn’t pleasant at all to eat. atmosphere-wise, the clientele in my many visits has appeared more varied, with a mix of age, gender, ethnicity. i’ve rarely seen it extremely full, but then again, i dislike the general craziness that a weekend can bring to the mall and in particular the parking lot. on a weeknight, if you are eating in a group of 4 or less, it should be easy to get a table without reserving. incidentally, the Chinese name for Chung King Garden is apparently something completely different (e.g. not phonetic in translation). so how did the two restaurants compare? if Chung King had consistent crispness across all the pieces of skin, it would have been a closer call. i liked the bigger pieces of skin, the offering of a lettuce wrap course, and the basic condiments were perfectly fine. Dayali wins on the soup, the crispness of the skin (i do wish the pieces were a bit bigger), presentation and condiment selection. the peking duck aside (and assuming the extra $ compared to CK), i’m not one for places that are too crowded or that require a lot of waiting in line. i have yet to try enough supplemental dishes at Dayali to judge on their other food (do note that there seem to be many offal type dishes, if you’re into that). for now, based on these 2 meals (both eaten within December, 2012), Dayali edges out Chung King. are you a peking duck fan? if you’ve eaten at either of these restaurants, what did you think?